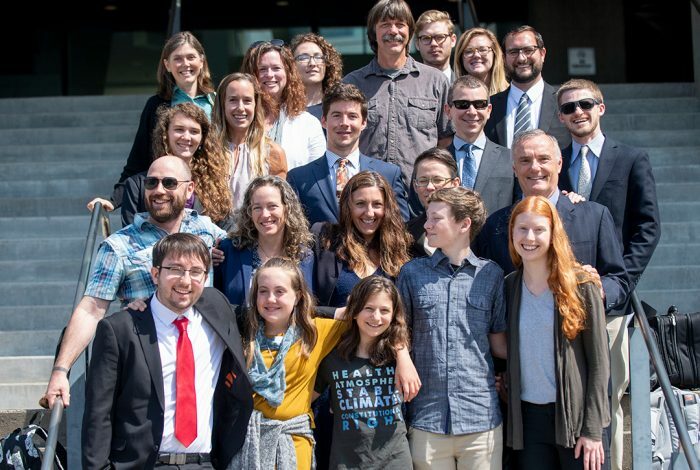 The 21 plaintiffs, ranging in age from 11 to 22, in Juliana v. United States — which the US government has kept from going to trial through legal maneuvers — filed a motion Thursday night for a preliminary injunction to halt new fossil fuel development. The plaintiffs seek three things: 1) to prevent the federal government from issuing leases and mining permits for extracting coal on public lands; 2) to prevent the federal government from issuing leases for offshore oil and gas exploration and extraction; and 3) to halt approvals for new fossil fuel infrastructure, before the March 20 lease sale of about 78.5 million acres of new oil and gas drilling in the Gulf of Mexico. The Juliana case was brought in 2015. It asserts that the government is violating the youths’ rights by failing to curb carbon dioxide emissions. The government has filed several motions to dismiss or postpone the trial. In addition to the proposed March 20 sale, the motion points to 60 new oil and gas pipelines, 32 new liquefied natural gas and coal terminals, and one new deepwater-port oil export facility awaiting federal approvals. All would be halted by the injunction. Increased carbon dioxide levels in the earth’s atmosphere pose a number of severe ecological and health risks, which have already been felt by some of the plaintiffs. Studies have shown that human-caused climate change may not only be exacerbating asthma in people who already present asthma, but actually increasing people’s susceptibility to it, therefore increasing its prevalence. In Hawaii, 19-year-old plaintiff Journey Zephier noted the impact climate change has had on his own immediate environment. Aside from the direct effects that climate change has on humans, international expert witnesses working pro bono on this case have filed other declarations explaining the economic benefits of the injunction. “An injunction on future leases and mining permits for extracting coal on federal public lands and on future leases for offshore oil and gas exploration and extraction activities, alongside enjoining new fossil fuel infrastructure requiring federal approval will prevent, not cause, economic harm,” economist and Nobel Laureate Joseph Stiglitz said in one such declaration. Experts predict that the economic impact of climate-change-induced rising sea levels and public health crises will be staggering. Factoring in deaths, disease, lost wages from too-hot working conditions, abandoned coastal properties, and other effects, the ultimate costs of global warming each year are estimated to be in the hundreds of billions of dollars. A report in 2017 noted that climate change cost the US economy at least $240 billion a year over the previous 10 years. And that number, according to National Geographic, did not include September 2017’s three major hurricanes or 76 wildfires. The economic toll for those disasters alone is estimated at more than $300 billion — enough to provide four years of free tuition for all 13.5 million US students enrolled in public higher education. Related front page panorama photo credit: Adapted by WhoWhatWhy from court logo (Ninth Circuit Court – PDF) and logos (Our Children’s Trust – PDF).